Do not go through all of the work for decorating for a New Year's Eve Party and not place centerpieces on the tables. 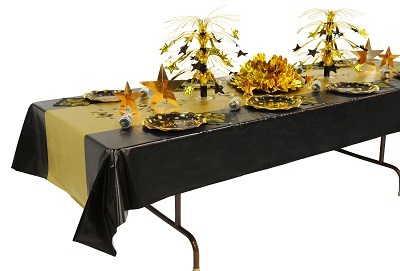 Select from a huge selection of bulk Happy New Year Centerpieces that are available in bright assorted colors and classic black, gold and silver. In addition, you will find metallic table skirting, table covers, plates, cups, and napkins to complete your New Year's Eve decor. Decorating for New Year's Eve does not have to be a chore. Take a look at this fully decorated table. It really only has three main components. You have the table cover over the entire table, then you have your New Year plates that are clearly a must have. And finally you have some minimal decorations on the table. With two star cascade centerpieces, and metallic flutter ball, star and confetti you get this classic yet elegant New Year's Eve look. Plates, cups and napkins are three items that you cannot forget on New Year's Eve, that is unless you are having a caveman party. Party Express has a great selection of black and gold New Year's Eve plates that say Celebrate! and that is exactly what we want you to do this New Year's Eve. Celebrate December 31st with our huge selection of New Year's Eve decorations that will impress even the most difficult party guest.